When the Little Engineer and I adapted Valentine’s Day in Vicarstown into a storytelling wooden train layout, we read the book several times in the process. 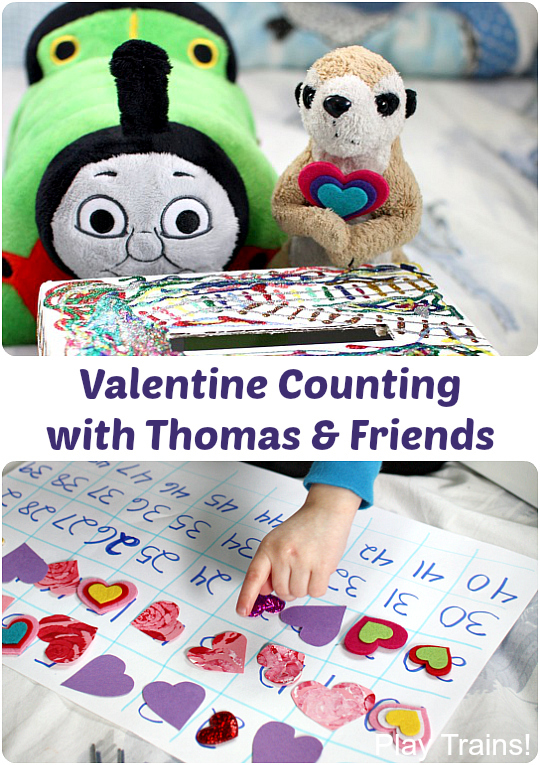 So when I started to set up this valentine counting activity based on the same book, the Little Engineer knew exactly what we were doing — and he was very excited about it! An earlier version of this post was originally published on February 12th, 2013, when the Little Engineer was three years old. It contains links to Amazon.com. If you click on one, we will receive a small commission — at no additional cost to you — on anything you buy at Amazon for a certain length of time afterwards. Read our disclosure policy for more details. The Little Engineer already had given Thomas all the valentines when we played the story before, so I was pretty sure that once again we’d be departing from the book on the matter of who got the most valentines. I was okay with that, as long as we learned a bit about counting along the way. I also made a number chart. 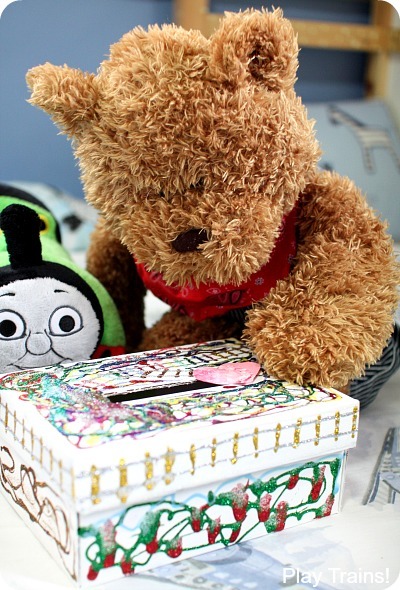 I needed it to go up to at least forty-one, the combined number of valentines that Thomas and Percy get in the book. As soon as I set it down, the Little Engineer started counting. 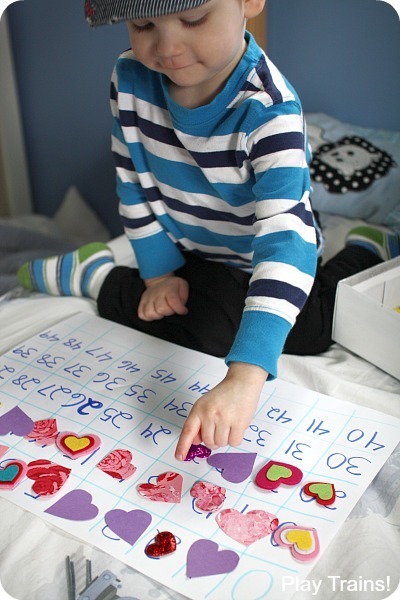 Then we lined up our valentines (including some of the felt hearts we made for freight last week) to make sure we had the right number, talking about how twenty and twenty-one added up to forty-one. I could tell he already had his own ideas about how he wanted to do the activity, so I asked him how it was going to work. He said the children needed to put the valentines in the engines’ mailboxes, and he suggested that we have stuffed animals be the children. That had been my idea as well, but it’s so much better that he came up with it himself. Strawberry Kitty and Engineer Bear, among others, were quite happy to play the parts of the children of Sodor. 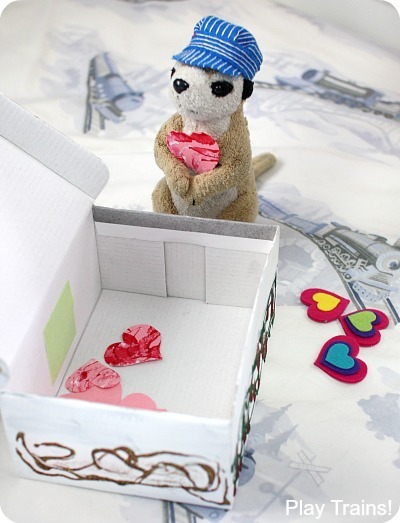 But then the Little Engineer decided that the engine drivers should be the ones putting the valentines in the mailboxes, so Meerkat (a fully-qualified engineer himself) started putting them in, naming the children they were from as he did. The Little Engineer really seemed to like naming who the valentines were from. We kept it up for a while, eventually having one be from Sir Topham Hatt, as happens in the book. Then he and Meerkat counted their engines’ valentines. As predicted, Thomas had far more than Percy. I had the Little Engineer count Thomas’ by putting them on the number chart. The Little Engineer is pretty solid up through 20 or 21, but seems to lose interest after that, so this was a good activity to push him past that point. After we counted Thomas’, we added Percy’s to the chart and talked about how the two new numbers added up to the same total as before. And then we started over. I think we played it through three times, though his interest in the counting part diminished each time. He really enjoyed putting the valentines in the box, so he kept wanting to go back and do that again right away. I did get him to count a bit longer than he might have by taking turns putting the hearts onto the chart, but finally we dropped that and just had fun. After Valentine’s Day, he asked to add his chocolate hearts to the valentines in the boxes. We’re still playing this a year later, thanks to the addition of chocolate! We each get to eat one small piece of chocolate each time we play. 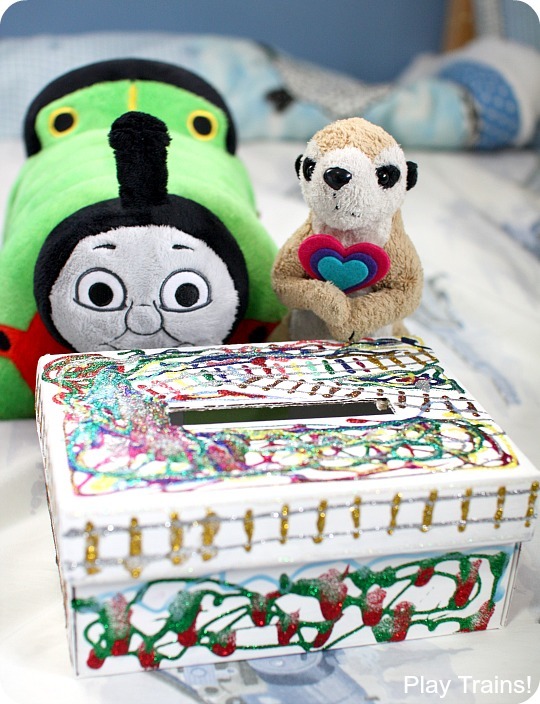 You’ll find lots of ideas for decorating a wooden train layout for Valentine’s Day in this literacy activity, inspired by the Thomas & Friends book, Valentine’s Day in Vicarstown. Looking for train valentines for your little engineer to hand out? I had a hard time getting train valentines the first year I looked for them, so I tracked down as many as I possibly could to share here. Here are some great train Valentine’s Day cards available online, and a list of free printable train valentines as well. 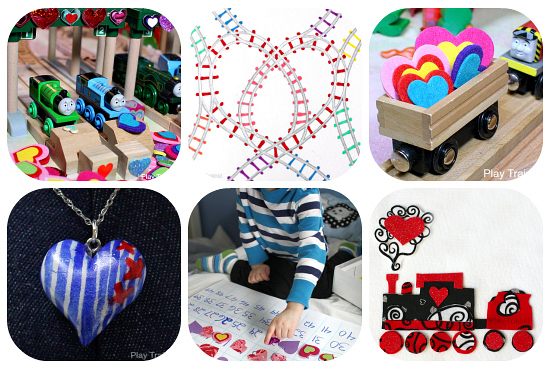 If you’re looking for an unusual — and unusually pretty — train valentine for your child, these DIY train track valentines might be just the thing! With their fuzzy yet solid feel, these easy-to-make felt hearts are wonderful valentine freight for toy trains and great counters for counting activities. 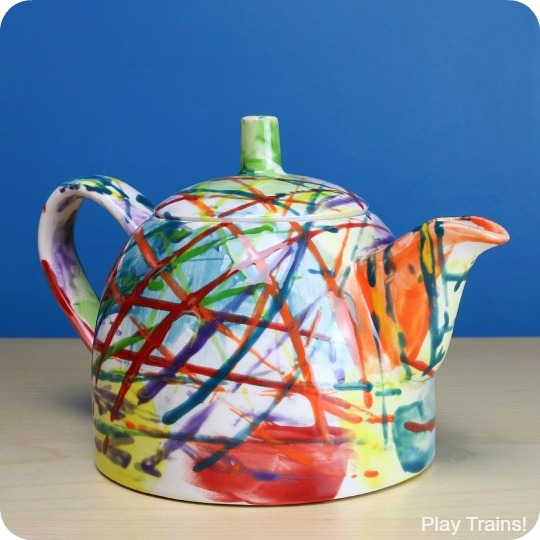 These make beautiful gifts for train lovers (or the mothers of train-loving kids) for Valentine’s Day — or any other special day! 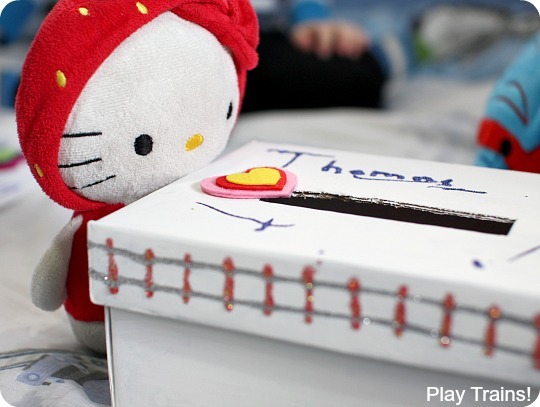 A pretty and engaging felt train play set that’s quick to make for Valentine’s Day. 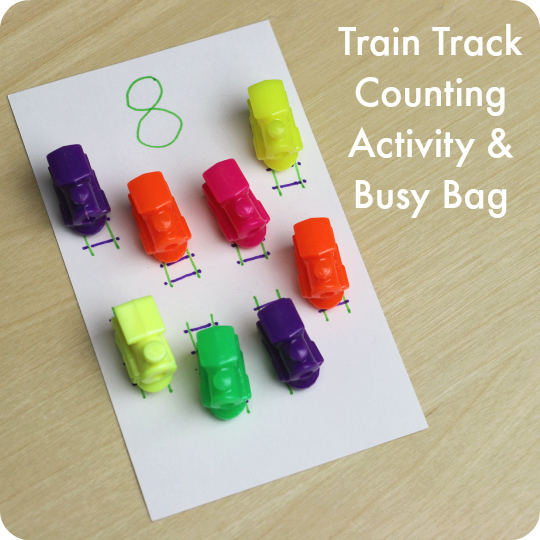 What a fun way to teach counting and adding. And letting he decide how to do it was great! Learning can be so much fun! Thanks for sharing on We Made That! Thanks! I was really pleased when he started running the show. 🙂 Thanks for stopping by. I love how there was some creative storytelling going on here in addition to the counting. Yeah, the Little Engineer tends to bring storytelling into everything. He either got my writer genes or my father-in-law’s storyteller genes. So funny! It’s great the way a book can inspire extended storytelling into all aspects of play. Thanks for sharing at The Children’s Bookshelf. Yes! It’s one of my favorite things about reading books with the Little Engineer. This looks like a wonderful way to retell a story. I will be sharing this post on the Read.Explore.Learn. Facebook page and Pinterest board. Thanks, and I appreciate the links! This is absolutely adorable! Your pictures are great. Thanks for sharing on Share it Saturday! 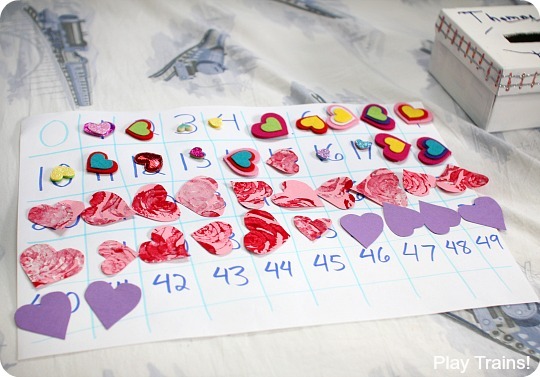 That is a great counting activity and a wonderful way to reuse those hearts. Thanks! It definitely worked out to have those hearts. What a great idea!! I love it. Thank you for sharing at Sharing Saturday!